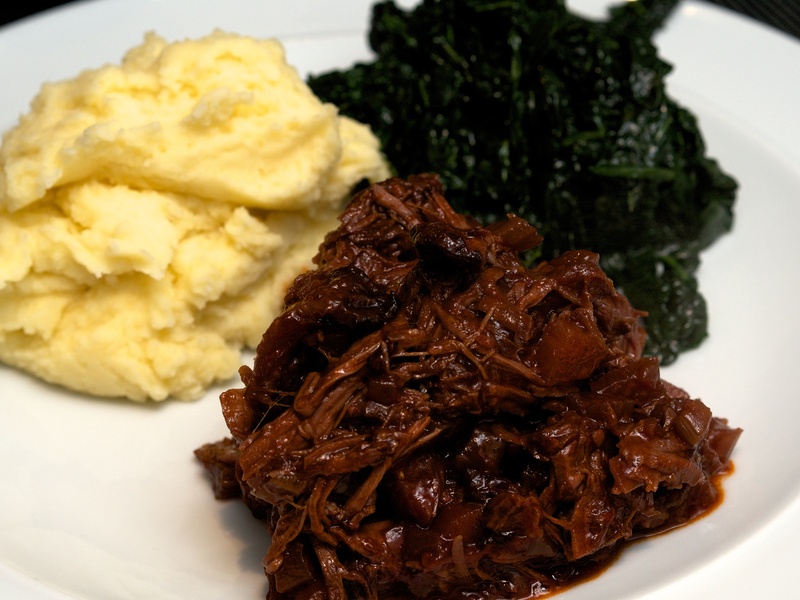 Take a shin of beef and braise it for hours in a bottle of Chianti until it can be carved with a spoon … what’s not to like! Wine Suggestion: the obvious choice is Chianti but given the richness and depth in the food make sure it is one with a bit of depth; younger, or more basic Chianti is just too light. We tried one by Tenuta Sant’Alfonso which comes from a specific vineyard with clay-rich soils which was opulent and fuller structured. It had licorice, dark cherry and mocha flavours which was a great match. Season the meat, then brown in a large casserole with a little olive oil. Remove the meat and cook the onions, celery, carrot and garlic until softened, adding a bit more oil if needed. Pour in the wine and bring to the boil before adding the tomato purée, bay leaves & beef stock. Return the beef to the pan and bring to a simmer. Cover with a lid and cook in the oven for 4 hours or until the meat falls apart. When ready, pull the meat into chunks and stir through the sauces. Serve with mash or fresh pappardelle pasta.